CD14 (cluster of differentiation 14), also known as CD14, is a human gene. The protein encoded by this gene is a component of the innate immune system. CD14 exists in two forms, one anchored to the membrane by a glycosylphosphatidylinositol tail (mCD14), the other a soluble form (sCD14). Soluble CD14 either appears after shedding of mCD14 (48 kDa) or is directly secreted from intracellular vesicles (56 kDa). 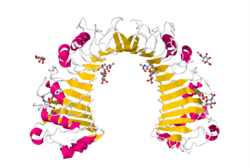 The x-ray crystal structure of human CD14 (4GLP.pdb) reveals a monomeric, bent solenoid structure containing a hydrophobic amino-terminal pocket. CD14 was the first described pattern recognition receptor. CD14 acts as a co-receptor (along with the Toll-like receptor TLR 4 and MD-2) for the detection of bacterial lipopolysaccharide (LPS). CD14 can bind LPS only in the presence of lipopolysaccharide-binding protein (LBP). Although LPS is considered its main ligand, CD14 also recognizes other pathogen-associated molecular patterns such as lipoteichoic acid. CD14 is expressed mainly by macrophages and (at 10-times lesser extent) by neutrophils. It is also expressed by dendritic cells. The soluble form of the receptor (sCD14) is secreted by the liver and monocytes and is sufficient in low concentrations to confer LPS-responsiveness to cells not expressing CD14. mCD14 and sCD14 are also present on enterocytes. sCD14 is also present in human milk, where it is believed to regulate microbial growth in the infant gut. CD14+ monocytes can differentiate into a host of different cells, including dendritic cells, a differentiation pathway encouraged by cytokines, including GM-CSF and IL-4. CD14 has been shown to interact with lipopolysaccharide-binding protein. ↑ Setoguchi M, Nasu N, Yoshida S, Higuchi Y, Akizuki S, Yamamoto S (July 1989). "Mouse and human CD14 (myeloid cell-specific leucine-rich glycoprotein) primary structure deduced from cDNA clones". Biochimica et Biophysica Acta. 1008 (2): 213–22. doi:10.1016/0167-4781(80)90012-3. PMID 2472171. ↑ Simmons DL, Tan S, Tenen DG, Nicholson-Weller A, Seed B (January 1989). "Monocyte antigen CD14 is a phospholipid anchored membrane protein". Blood. 73 (1): 284–9. PMID 2462937. ↑ Kirkland TN, Viriyakosol S (1998). "Structure-function analysis of soluble and membrane-bound CD14". Progress in Clinical and Biological Research. 397: 79–87. PMID 9575549. ↑ Kelley SL, Lukk T, Nair SK, Tapping RI (February 2013). "The crystal structure of human soluble CD14 reveals a bent solenoid with a hydrophobic amino-terminal pocket". Journal of Immunology. 190 (3): 1304–11. doi:10.4049/jimmunol.1202446. PMID 23264655. ↑ Kitchens RL (2000). "Role of CD14 in cellular recognition of bacterial lipopolysaccharides". Chemical Immunology. Chemical Immunology and Allergy. 74: 61–82. doi:10.1159/000058750. ISBN 3-8055-6917-3. PMID 10608082. ↑ Tapping RI, Tobias PS (2000). "Soluble CD14-mediated cellular responses to lipopolysaccharide". Chemical Immunology. Chemical Immunology and Allergy. 74: 108–21. doi:10.1159/000058751. ISBN 3-8055-6917-3. PMID 10608084. ↑ Ranoa DR, Kelley SL, Tapping RI (April 2013). 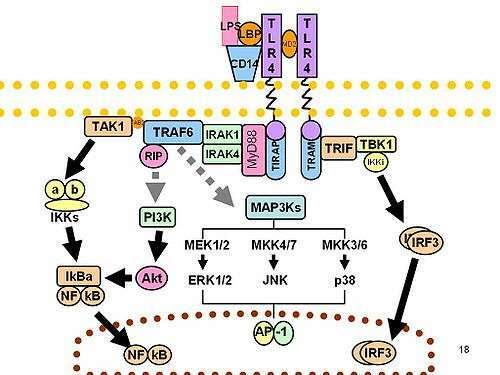 "Human lipopolysaccharide-binding protein (LBP) and CD14 independently deliver triacylated lipoproteins to Toll-like receptor 1 (TLR1) and TLR2 and enhance formation of the ternary signaling complex". The Journal of Biological Chemistry. 288 (14): 9729–41. doi:10.1074/jbc.M113.453266. PMID 23430250. ↑ "CD14 Is Expressed and Released as Soluble CD14 by Human Intestinal Epithelial Cells In Vitro: Lipopolysaccharide Activation of Epithelial Cells Revisited". ↑ Thomas CJ, Kapoor M, Sharma S, Bausinger H, Zyilan U, Lipsker D, Hanau D, Surolia A (November 2002). "Evidence of a trimolecular complex involving LPS, LPS binding protein and soluble CD14 as an effector of LPS response". FEBS Letters. 531 (2): 184–8. doi:10.1016/S0014-5793(02)03499-3. PMID 12417309. ↑ Yu B, Wright SD (1995). "LPS-dependent interaction of Mac-2-binding protein with immobilized CD14". Journal of Inflammation. 45 (2): 115–25. PMID 7583357.